Church of Jesus Christ of Latter-day Saints, Record of Members Collection. CR 375 8, box 7701, folder 1, images 300-301; box 4166, folder 1, image 106; box 7704, folder 1, images 121, 195. Church History Library, Salt Lake City, Utah. Ellsworth, German E. to Joseph F. Smith, 24 December 1909. Northern States Mission. Church History Library, Church of Jesus Christ of Latter-day Saints, Salt Lake City, Utah. Kirchhoff, Esther Jane Scott. Findagrave.com. Kirchoff, Richard and Ester Scott, 06 Apr 1892. "Wisconsin, County Marriages, 1836-1911." Database, FamilySearch. Microfilm 1,275,605. Family History Library, Church of Jesus Christ of Latter-day Saints, Salt Lake City, Utah. The Oshkosh Northwestern (Oshkosh, Wisconsin), 10 December 1915, 2; 23 February 1932, 8; 1 April 1933, 8. United States, Census. 1900, 1910, 1920, 1930, 1940, Oshkosh, Winnebago County, Wisconsin. Wisconsin, State Censuses, 1895 and 1905. Database on-line at Ancestry.com. Originals at Wisconsin Historical Society, Madison, Wisconsin. Richard Kirchoff and Ester Scott, 06 Apr 1892, "Wisconsin, County Marriages, 1836-1911," database, FamilySearch, microfilm 1,275,605, Family History Library, Church of Jesus Christ of Latter-day Saints, Salt Lake City, Utah. United States, Census, 1900, Oshkosh, Winnebago County, Wisconsin; Wisconsin, State Censuses, 1895 and 1905 database on-line at Ancestry.com, originals at Wisconsin Historical Society, Madison, Wisconsin. United States, Census, 1910, 1920, 1930, 1940, Oshkosh, Winnebago County, Wisconsin. “Kirchhoff,” Presiding Bishopric stake and mission census, 1914-1935, CR 4 311, Church History Library, Church of Jesus Christ of Latter-day Saints, Salt Lake City, Utah. German E. Ellsworth to Joseph F. Smith, 24 December 1909, Northern States Mission, Church History Library, Church of Jesus Christ of Latter-day Saints, Salt Lake City, Utah. Church of Jesus Christ of Latter-day Saints, Record of Members Collection, CR 375 8, box 7701, folder 1, images 300-301, Church History Library, Salt Lake City, Utah. Oshkosh Branch, Wisconsin, Northern States Mission, Record of Members, Historical, 1904-1907, CR 375 8, WR 4685, p. 4, Church History Library, Church of Jesus Christ of Latter-day Saints, Salt Lake City, Utah. United States, Census, 1900, 1910, 1920, 1930, 1940, Oshkosh, Winnebago County, Wisconsin; Wisconsin, State Census, 1905. The Oshkosh Northwestern (Oshkosh, Wisconsin), 10 December 1915, 2; “Program Held by Woodman Circle,” The Oshkosh Northwestern, 23 February 1932, 8; “Is Hostess to Oshkosh Grove,” The Oshkosh Northwestern, 1 April 1933, 8. Oshkosh Branch, Wisconsin, Northern States Mission, Record of Members, Historical, 1904-1907, 8. Oshkosh Branch, Wisconsin, Northern States Mission, Record of Members, Historical, 1904-1907, 8-13, 46. Nettie’s husband Richard was also an important leader in the branch. He sometimes served in the Sunday School organization and when an LDS youth group, the Mutual Improvement Association, was organized at Oshkosh he became president. Hurbert Wilson served as Kirchhoff’s first assistant and Katherine Mollinet as his second assistant; May I. Cavander was secretary. See page 15 of the branch record. James Grant Missionary Journal, 1903-1904, MS 19933, pp. 21, 22, 30, 33-37, 51, 54, 58, Church History Library, Church of Jesus Christ of Latter-day Saints, Salt Lake City, Utah. James Grant Missionary Journal, 71, 72. “Kirchhoff,” Presiding Bishopric stake and mission census, 1914-1935; Church of Jesus Christ of Latter-day Saints, Record of Members Collection, CR 375 8, box 4166, folder 1, image 106; box 7704, folder 1, images 121, 195, Church History Library, Salt Lake City, Utah. 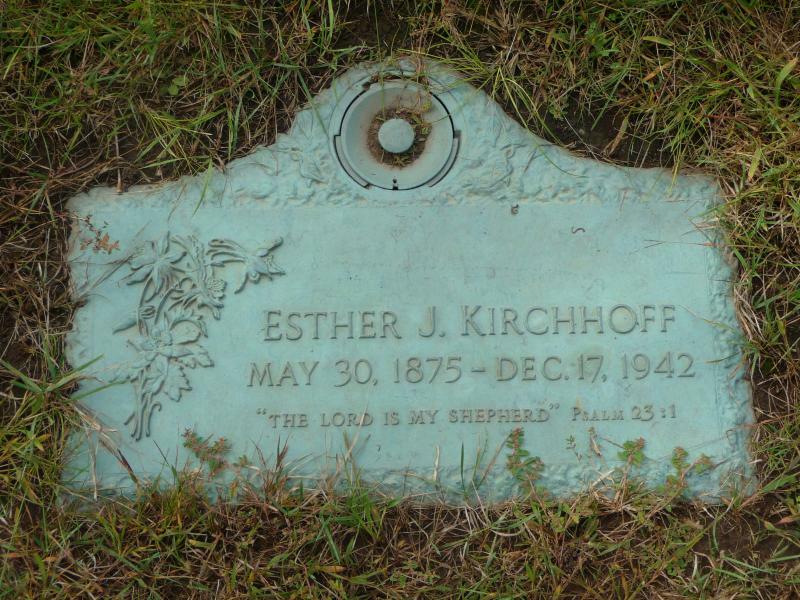 Esther Jane Scott Kirchhoff, Findagrave.com.